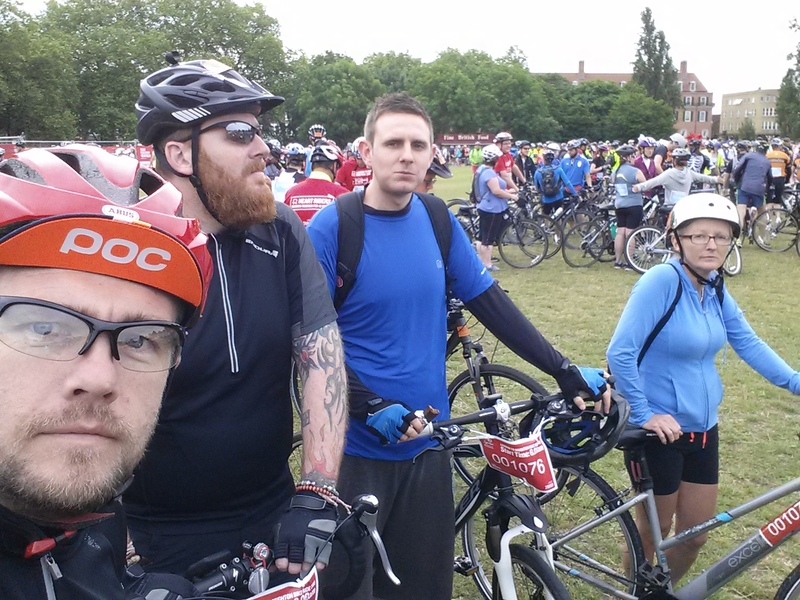 Every June, on Father's Day, I take part in the London to Brighton bike ride for the British Heart Foundation. This year I made it my century ride. 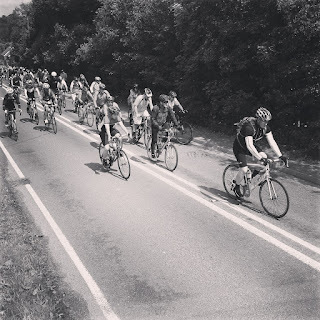 By the first week of June I'd not made plans for my next 100 mile ride but by a stroke of genius, a friend suggested that I just extend the London to Brighton. The ride is 53 miles so you may be thinking that I just had to turn around and ride back to the start. Well, many people do but I didn't need to. Every year, my friend gets his sister to take us from his house in Bexhill. I drive over in the morning and have to come back to Bexhill after the ride to collect my car. With a little planning all I needed to do was work out a route from Brighton to Bexhill in 47 miles. A colleague of mine is training for riding Land's End to John o'Groats and asked that next time I did a 100 mile ride, could she come too. As luck would have it, she too was riding the London to Brighton after another colleague had to pull out due to injury, so we were both starting the ride at the same time. Knowing my colleague hadn't cycled that distance before, I set out to plan the return route keeping the ride as flat as possible. There are some hills you can't avoid but by carefully routing along the National Cycle Network I managed to keep the elevation to a minimum. On the day, it was an early start. I had to be in Bexhill by 5am which is 10 miles from my house. Once there I fitted my bike to the roof of my mates car and it was time to leave. At that time of the morning the journey to London is always straightforward and quiet. We arrived near the start, offloaded our bikes and got our stuff out of the car. It was a slightly fresh morning but the forecast was good. It was set to be 21 degrees celsius, slightly cloudy and a westerly wind. Going north to south meant there would be a cross wind but the nature of the roads you travel on meant it would offer us shelter for most of the ride. The bonus however would be on the ride back from Brighton where we'd have a tailwind. The start was busy and it seemed that the release of riders was behind schedule. It took half an hour from when we arrived at Clapham Common until we started the ride. The start can be notoriously slow unless you get away early (you can opt to start at 6am). Starting as late as we did would normally mean gridlock getting out of London. In fact, the cycle traffic on the route was less than I think I've ever experienced. The four of us set out together and for the first handful of miles we all stuck together. It wasn't long before we started to get split up. My intention was to stay with my century buddy for the entire ride and as she was the slowest rider of the group, I would wait at the top of any hills and we would then regroup. The ride was leisurely but constant. We had one bottleneck where someone was receiving medical attention at the bottom of a climb which forced a lot of people to get off and walk. As we reached the part of the ride where you go under the M25, it's a long fast descent. I was taking it easy and not too fast. At the bottom there is a 90 degree right turn and a big wall of hay bales to catch any that can't stop in time. As I started to make the turn I could feel my front wheel sliding out from under me. I'd scrubbed a lot of speed off before taking the corner and put my right foot down to stop myself from hitting the deck. I rolled over to the side of the road and checked my front tyre. It seemed I had a slow puncture. I decided to just pump the tyre up and see if I could carry on. It wasn't long though before I could feel the front tyre struggling for grip again. About a mile down the road I pulled over somewhere safe and I changed the inner tube. After that it was pretty much a straightforward ride down to Brighton. We just stopped whenever we needed along the way for food and toilets. It wasn't until we got to the top of Ditchling Beacon that I noticed the wind for the first time. Being so high up it was quite breezy. The forecast was right though, it was westerly so should give us some help. The descent into Brighton from the beacon is fast and I hit 50mph! Once we arrived in Brighton, it was pretty much just half way for two of us. We now had the ride back to Bexhill. We grabbed our medals and were on our way. The route along the coast headed east is a series of rolling hills as you ride over the chalk cliffs. The wind was behind us and pretty strong. We road through Rottingdean, Saltdean, and Peacehaven before finally descending into Newhaven. The route then took us along a flat cycle path to Seaford and then a gradual climb out the other side to Exceat. 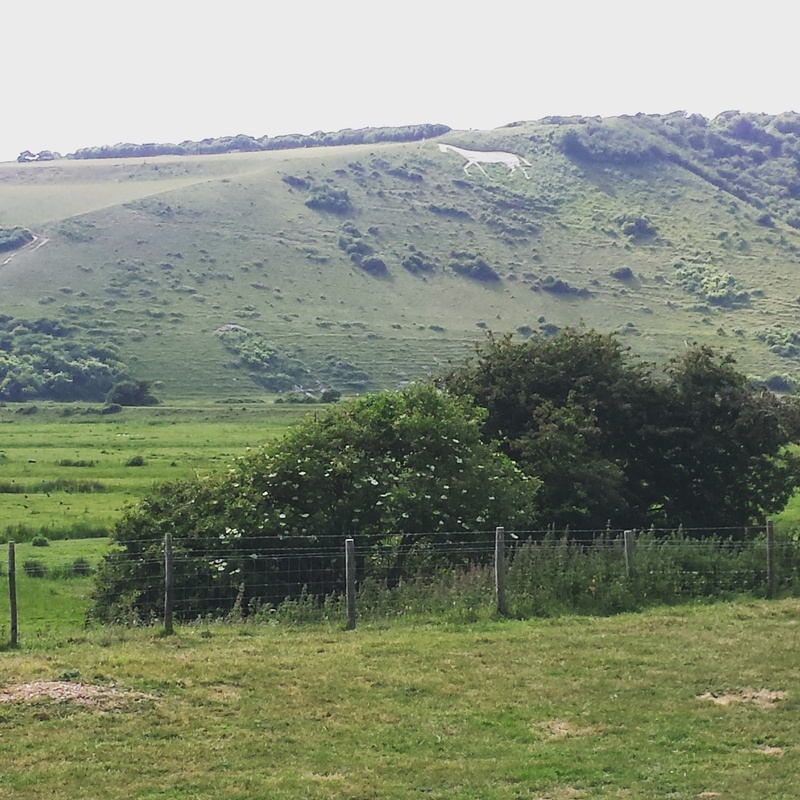 At this point we headed north to Litlington and Lullington before taking a short detour to Alfriston for a coffee and a slice of cake. From there we headed towards Berwick turning east again, passing Abbots Wood and Arlington. The roads are quiet and fairly flat practically the whole way home now. Being a nice sunny day can mean a lot of traffic on the roads. It was so nice to be on quiet country lanes. Now in Hailsham we went through Magham Down and across the Pevensey Levels towards Rickney before heading through Normans Bay and Cooden Beach and we were finally in Bexhill. It was at this point we went our separate ways and I had 5 miles left to do. I was a little short on my calculations so had to go around the houses a bit to get back to my car and hit 100 miles at the same time. When I arrived at my friends house to collect my car I had a coffee and a slice of cheesecake. It'd been a long day but not such a tough ride having ridden it at a slower rider's pace. I'm now halfway through my century rides. Hopefully it'll get easier from now on?